4.4 out of 5 based on 110 bloggers and 83 commenters. 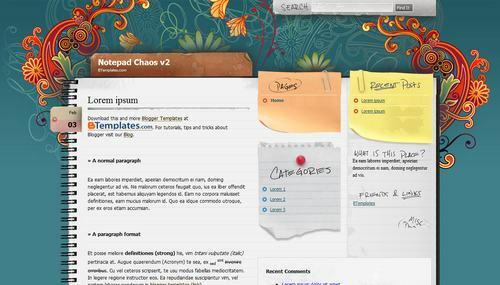 Notepad Chaos v2 is a free blogger template adapted from WordPress with 3 columns, floral motifs and vectorial elements. Excellent template for blogs about art or desktop. Hola a todos, la verdad es que me gusta mucho la página. He instalado este template.. i me da como undefined la fecha de publicacion de los post. Que puedo hacer para que aparezca? @Laura: Ve a Configuración/Formato y cambia el formato de la hora (no el de la fecha, porque no es lo mismo) a “Miércoles, Julio 7, 2010”. To change UNDEFINED you need to set the date in PACIFIC TIME +8 gmt :p also had the same problem! oi, salvei o template, achei ele lindo. Mas não sei o q aconteceu. Ele está ficando nos elementos de páginas, com dois espaços para postagem. ai, toda vez q vou postar aparecem duas postagens iguais, duplicadas. I just love this template! I just have one question…. before, in the top right corner, there was a section for me to ‘sign in’ so taht i could be taken to my dashboard to edit stuff, make new posts…well, this is gone! where can i easily click to sign in and do this???thanks! @Tracey Wilson You can find the answer to your questions and more in our FAQ section. @Claudia: Hola Claudia, muchísimas gracias por el tip, yo tenía el mismo problema. Un abrazo. Hey, give-me a Help Please? What do I do to appear the dates? (1) How do I add the “About Me” back? (3) Is there a way to add another static page to this template? Please help as soon as you can. Thank you! i have tried all date formats in formatting section but it still appears undefined on posts. help me guys!! @zia: Go to Settings/Formatting and change the “timestamp format” (it is the hour format, not the date header format) to “Wednesday, October 20, 2010”. Can you tell me how to add information under the “recent posts” sidebar? I’ve reviewed the FAQs and still cant seem to make it work. how can I activate “categories”? please someone tell me …. I’ve fixed everything I had issues with EXCEPT I can’t get rid of the box that housed the recent comments. (1) How & Where do I change the font type and size for the widget title “Radial Clock”? I want to use a font called “Reenie+Beenie” found in the google api font directory. I tried most of the instructions mentioned in the faq but it didnt work out. would really appreciate if you can help me on this. (2) I want to extend the notepad background to have more space for my blog posts while the width for the other 2 columns remain the same. I tracked down something called ‘blog’in the html text and tried changing the width but then the top portion of the notepad didnt get widened. Havent still figured out how to do that. Please Help !! (5) the attribute section at the bottom of the page … i need to extend or reduce the font size there…. too much of stuff and really does not look neat. (6) finally i really like the way in which they have put icons hanging on the side of the bottom attribution bar and how i can navigate to the respective sites of the icons by clicking on them. How can i customize my own icons over there and can i remove those icons. since you created them, hope that is fine. Request you to kindly answer my queries. got my hands dirty as much as i could, but to no avail. would really appreciate some professional help on this . Thanks, I was hoping to find a solution to this online. It worked just fine! Also, I cannot seem to get rid of the box titled “Recent Comments”, whenever I try to delete the xml I get an error saying that it cannot be saved. I am just setting up my blog using this template and was wondering if there is a way to change the title of “CATEGORIES” to something else? I love the notepaper it’s on but would prefer a different title there. thanks. Loving it…..still need to iron out a few kinks but workable and sooo purty! I like this Template verry mutch !!! Can i add a RSS-button? And how? I’m getting an error and am unable to use the template…might anyone know why? When I opened the file in winrar, I just right clicked the xml and chose view and copy and pasted what was in wordpad into the html box. What is the Categories section for? I want it, it;s cute, but I don’t know what it is..
Love the template, but how can I remove the recent comment box? It would appear that this template is no longer being developed, nor this page even read. Is that correct? So should I assume the template has been abandoned? Or is there somewhere else to go to get questions answered like how to get post dates posted. There is only a blank left where the full date, not the tab-like date are shown. used to be taking a look for. You’ve ended my 4 day long hunt!